Alfonso Soriano (born January 7, 1976, in San Pedro de Macoris , Dominican Republic ) is a professional Major League Baseball outfielder for the Chicago Cubs. He previously played for the New York Yankees, Texas Rangers and Washington Nationals. He played primarily as a second baseman for the Yankees and Rangers. He bats right-handed, and has batted as a lead-off hitter for most of his career. Soriano began his professional baseball career in Japan with the Hiroshima Carp, training at their Carp Academy for Dominican players. In 1997, he was promoted briefly to the varsity team, and, wearing uniform number 74, he appeared in nine games, batting .118 (2 for 17) with two walks. In 1997, Soriano earned a salary of $40,000. Soriano finished his career in Japan by retiring from his contract and signing as a free agent with the New York Yankees, using a loophole that had previously been used by Hideo Nomo. Soriano signed as a free agent with the New York Yankees in 1998, starting his career as an infield player, and played in New York for five seasons. His first hit in the MLB came in 1999 when he hit a game-winning home run against Norm Charlton of the Tampa Bay Devil Rays. He finished in third place for Rookie of the Year honors in 2001. In the World Series that year, he hit the would-be game and series winning home run off of Arizona Diamondbacks pitcher Curt Schilling, but was denied the series winning run when Luis Gonzalez hit his famous series-winning bloop single on a cut fastball by closer Mariano Rivera. In 2002, Soriano led the American League with 696 at bats, 209 hits, 92 extra base hits, 41 stolen bases, 128 runs and set a New York Yankees team record for most at bats (696) and most strikeouts (157) in a season. While he was hitting home runs, he wasn't taking many walks. He is one of only six players active in 2009 who have concluded a 30-homer season with more homers than walks (39 HR, 23 BB), the others being Ryan Braun (34–29 in 2007), Garret Anderson (35–24 in 2000), Ivan Rodriguez (35–24 in 1999), Joe Crede (30–28 in 2006), and Jose Guillen (31–24 in 2003). 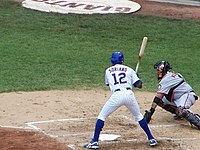 In 2003, Soriano set the record for most home runs to lead off a game in a season with 13, and for the second straight year, led the league in at bats, and finished in the top five for hits, doubles, home runs, stolen bases, and strikeouts. In 2004, the Yankees traded Soriano to the Texas Rangers (along with minor leaguer Joaquin Arias) for Alex Rodriguez and cash amounting to $67 million of the $179 million remaining on Rodríguez's contract. On May 8, 2004, Soriano had six hits in nine innings—the first Texas Ranger to do so—in a 16–15, 10-inning victory over the Detroit Tigers. The game featured a bizarre, hour-long fifth inning, where Detroit scored eight runs in the top half of the inning to take a 10-run lead over the Rangers, only to see Texas score 10 runs in the bottom half of the inning to tie the game, the largest deficit ever overcome by the Rangers and tying an MLB record for most runs in an inning by two teams. That same year, Soriano was elected to the All-Star Game as the starting second baseman. He hit a three-run home run off Roger Clemens in the first inning and was named the MVP of the game. In 2005 he finished sixth in the AL for stolen bases, and third for extra base hits (as well as eighth for strike-outs). On December 7, 2005, Soriano was traded to the Washington Nationals in exchange for Brad Wilkerson, Terrmel Sledge, and minor league pitcher Armando Galarraga. On February 10, 2006, Soriano set a record for the highest salary ever awarded in arbitration, receiving $10 million, even though he lost his request of $12 million. The previous high had been set in 2001 by Andruw Jones of the Atlanta Braves when he earned $8.2 million. The Nationals offered Soriano a five-year, $50-million extension, but Soriano rejected the offer. Soriano and his agent Diego Bentz instead opted to open contract negotiations during the off-season, so that he would become a free agent and would be capable of earning a greater salary. On March 20, 2006, Nationals manager Frank Robinson wrote Soriano in the lineup to play left field. Soriano, who since 2001 had played exclusively at second base, refused to take the field, and the Nationals organization threatened him with disqualification, which would have meant forfeiture of his salary, and he would not have received credit for service time in fulfillment of the obligations of his contract. With his contract's service terms officially still unfulfilled, he would then not have been eligible for free agency at season's end. Two days later, Soriano relented and played in left field for the Nationals in their exhibition game against the St. Louis Cardinals. Robinson indicated that he considered Soriano's move to left field to be permanent and would not consider moving Soriano back to second base at any point during the season. In his comments following that game, Soriano indicated that he would accept his new position without further argument. As the season got underway, however, Soriano began to enjoy his new position, and by the All-Star break, he led the league in outfield assists and became one of the few players ever to start the All-Star game at two different positions. Soriano enjoyed the greatest season in his career in 2006. He shattered his previous career high in walks with 67 (previously 38). He also reached a career high in home runs with 46 (previously 39). He also had 41 stolen bases. On August 25, a week after reaching 30–30, he became the fastest man in baseball history to reach 200 home runs and 200 stolen bases, reaching the mark in 929 games (breaking the previous record of 1,053 games held by Eric Davis). On September 16, 2006, Soriano stole second base in the 1st inning to become only the fourth player to join the 40-40 Club, joining José Canseco, Barry Bonds, and Alex Rodriguez. Six days later he became the first person ever to reach 40 home runs, 40 stolen bases and 40 doubles in one season. As the trading deadline of July 31 approached, the Nationals were in a dilemma. On one hand, Soriano had initially expressed his distaste for playing left field, and he was in the last year of his contract, which would grant him free agency at the end of the season. If the Nationals lost Soriano at the end of the season, they would receive a first or second round draft pick and a "sandwich" pick in between the first and second round as compensation. Further, Soriano did not want to engage in contract negotiations during the season. On the other hand, as the deadline approached, Soriano expressed his enjoyment with left field, and his strong desire to stay with the team. Both fans and players began to be more vocal in their support to keep Soriano. Manager Frank Robinson praised Soriano's leadership in the clubhouse, and further suggested that Soriano should be considered for MVP of the National League. There were plenty of suitors, including sending Soriano back to the Yankees, and the Chicago Cubs and Los Angeles Dodgers were also interested. In the end, Nationals general manager Jim Bowden felt that what he was offered was not worth trading him. The "non-trade" was a risk for the Nationals and made headlines across the country.. The Nationals hoped to sign him to a long term deal before the season ended but on October 12, 2006 he rejected a $70 million deal. Chicago Cubs signed Soriano to an eight-year contract worth nearly $136 million. The contract marked the most expensive deal in the Cubs' franchise history. The Cubs' manager, Lou Piniella, assigned Soriano to play center field, but later moved him to left field after he sustained a hamstring injury. He struggled during the first month of the season, during which he posted a .270 batting average, with no home runs. He managed to hit his first home run during the Cubs' first game in May, and gradually increased his batting average throughout the month. Soriano was extremely productive in June. During a single game against the Atlanta Braves, Soriano hit three home runs off Lance Cormier. Soriano had accomplished the same feat in his past, coincidentally, also against the Atlanta Braves. During the subsequent game, Braves pitcher Tim Hudson hit him with a wild pitch. The home plate umpire deemed Hudson's actions to be unintentional, and warned both teams. Soriano also played an integral part in the Cubs' offense during the team's annual Cross-town Classic with the Chicago White Sox at US Cellular Field . He hit home runs in three consecutive games, and single-handedly out scored the entire White Sox's offense. His efforts merited the 'National League's Player of the Month' title for June. He was later selected as a reserve outfielder in the 2007 MLB All-Star Game, where he hit a two-run home run for the National League in the bottom of the ninth inning. Soriano led the Cubs in home runs during their National League Central chase in June and July, during which they erased the Milwaukee Brewers' eight game lead over the division. After losing the tie for first in early August, Soriano tore his right quadriceps during a game against the New York Mets on August 5. The Cubs placed him on the fifteen day disable list, and expected him to miss several weeks while recovering from the injury. Cubs used Matt Murton, who had been recalled from the Triple-A Iowa Cubs, in left field. He began to show signs of improvement around on August 21, when he was seen running and working out with trainers. Soriano stated he felt healthy enough to return in a few days, but made his actual return on August 28, 2007. Upon his return, Soriano proceeded to have the most productive September in the franchise's history. He hit fourteen home runs, twenty-seven runs batted in, and recorded a .320 batting average within twenty-nine games. Soriano said upon his return from the quad injury that he had also been suffering from wrist injuries and the time off to heal his leg also helped his wrists. The Cubs went on to win the National League Central Division, but were swept by the Arizona Diamondbacks in the National League Division Series. Soriano finished the season with thirty-three home runs (including eleven lead-off home runs), seventy runs batted in, and a .299 batting average. He led the Cubs in home runs, triples, runs, strikeouts, and Slugging percentage, among all regular starters. During the first few weeks of the 2008 season with the Cubs, Soriano struggled. He was only hitting .190 at the time he was put on the DL with a bad leg. After being activated, Soriano got off to a quick start, raising his average to .280 and increasing his home run total. In a one week stretch in May, he hit 7 home runs in just 6 games, hitting nearly .500 during that stretch. At the end of May he had 12 home runs and 33 RBIs. However, his defense was extremely poor, and after being placed on the DL early in the season, Soriano was encouraged to stop hopping as he caught fly balls. This seemed to affect his play in the field as he misjudged two balls in St. Louis on May 2, shortly after being activated. After being severely booed by Cub fans who had traveled to St. Louis in that particular game, he homered in the ninth to send the game to extra innings. Later that month, he lost a ball in the sun and dropped what would have been the game's final out in the 9th inning against the Pittsburgh Pirates, allowing Jason Bay to reach safely and eventually costing the Cubs a win. As poor as Alfonso's defense is perceived to be, his arm has been just as much as asset to the Cubs, and he was one of the league's leaders in outfield assists. Soriano also led the team in home runs, despite having played in only 109 games. On August 22, Soriano accomplished one of baseball's rarest feats, as he stole home plate in a loss to his old team, the Washington Nationals. Soriano at bat with the Cubs in . Soriano had gotten off to a quick start, hitting a solo home run in his first at bat of the 2009 season.Soriano also hit a game tying solo home run off LaTroy Hawkins in the 8th inning in the second game of the young season. On April 11, Soriano hit a 2-run home run off of Carlos Villanueva in the top of the ninth giving the Cubs a 6 to 5 victory over rival Milwaukee. Comcast Sportsnet awarded Soriano with "Play of the Day.". Soriano homered again, the very next day, on the first pitch he saw from Jeff Suppan, his 51st lead-off home run. On April 17 with one out in the bottom of the eighth Soriano hit a two run home run to give the Cubs a 8–7 lead over the St. Louis Cardinals. However, Soriano only hit .216 in the month of May. In voting for the 2009 All Star Game, Soriano was fourth among NL outfielders (2,692,994 votes), trailing Ryan Braun (4,138,559), Raúl Ibáñez (4,053,355), and Carlos Beltran (2,812,295). Shortly before the All Star break, manager Lou Piniella dropped Soriano in the batting order and made it clear that it was not a temporary change. For the first time in his career, Soriano seemed to accept not being a leadoff hitter and actually praised his manager for making the necessary decision citing the fact that, "I'm not doing my job." The batting order change helped Soriano. In the first series after the all-star break, he hit two go-ahead home runs against the Nationals. On July 27 he hit a walk-off grand slam against the Houston Astros during the 13th inning. On September 5, 2009, it was reported that Soriano is to undergo a knee surgery. The surgery is reported to sideline him for at least two weeks. In 2009, Soriano led all major league left fielders in errors, with 11, and the lowest fielding percentage among them (.950). On June 23, 2004 Soriano donated US$2.6 million to his home country for children wanting to become professional baseball players. He later appeared in Boys & Girls Clubs commercials urging children to play baseball. On December 16, 2008 he made an appearance at the Starke County Courthouse in Knox, Indiana for an autograph signing session. On May 17, 2009 Soriano appeared in a skit on WWE Judgment Day with The Miz and Santino Marella. Also after John Cena defeated The Big Show, Cena went over to Soriano in the crowd to give him a hug. Soriano is married to his wife Angelica; the couple has 2 daughters Alisis and Angeline; and a son, Alfonso Jr.
Muskat, Carrie, Cubs complete blockbuster with Soriano (November 20, 2007), MLB.com, Retrieved on August 6, 2007. Muskat, Carrie, Piniella considering Soriano in center (January 20, 2007), MLB.com, Retrieved on August 6, 2007. Wittenmyer, Gordon, Future could be now; Soriano's hamstring injury could mean top (April 17, 2007), Chicago Sun-Times, Retrieved on August 6, 2007. Yahoo! Sports, Alfonso Soriano - Chicago Cubs - Game Log (2007), Retrieved on August 6, 2007. Odum, Charles, Chi Cubs 9, Atlanta 1 (June 8, 2007), Yahoo! Sports, Retrieved on August 6, 2007. ESPN.com, Cubs' Soriano smashes 3 homers in first four innings (June 8, 2007), Retrieved on August 6, 2007. Odum, Charles, Atlanta 9, Chi Cubs 5 (June 9, 2007), Yahoo! Sports, Retrieved on August 6, 2007. Gano, Rick, Chi Cubs 3, Chi White Sox 0 (June 24, 2007), Yahoo! Sports, Retrieved on August 6, 2007. Crawly's Cub Kingdom, Gotta Love it - Sunday-Cubs 3 White Sox 0 (June 24, 2007), Retrieved on August 6, 2007. Schwartz, Michael, Soriano named Player of the Month (July 2, 2007), MLB.com, Retrieved on August 6, 2007. MLB.com, Rosters: By League, Retrieved on August 6, 2007. ESPN.com, MVP Ichiro hits All-Star Game's first inside-the-park homer (July 10, 2007), Retrieved on August 6, 2007. Muskat, Carrie, Soriano homers twice as Cubs win (July 28, 2007), MLB.com, Retrieved on August 6, 2007. Gano, Rick. Cubs' Alfonso Soriano out up to a month weeks after injuring quad running the bases against the Mets (August 5, 2007), Yahoo! Sports. Retrieved on August 5, 2007. Wittenmyer, Gordon. Jones, Cubs rock on (August 11, 2007), Chicago Sun-Times. Retrieved on August 22, 2007. Muskat , Carrie. Notes: Running encourages Soriano (August 21, 2007), MLB.com. Retrieved on August 22, 2007. Wittenmyer, Gordon, Soriano return set for Tuesday (August 27, 2007), Chicago Sun-Times, Retrieved August 27, 2007. Associated Press, Soriano's leadoff homer sets major league record, ties Cubs mark for September (September 28, 2007), SportingNews.com. Retrieved on October 21, 2007. Yahoo! Sports, 2007 Chicago Cubs Statistics. Retrieved on October 27, 2007.